In this series of blogposts, I have emphasized the drivers for change and the challenges the CFO Office is facing. Recently working with companies on their finance transformation roadmap, I have seen that a broader approach is required. Data is a strategic asset to get a 360° view for insight into a company’s business and digital leaders are looking at data through a new lens. To advance sustainable value creation by the CFO Office a 360°perspective is required to create and execute the modern finance transformation roadmap. How does the 360° perspective look like? 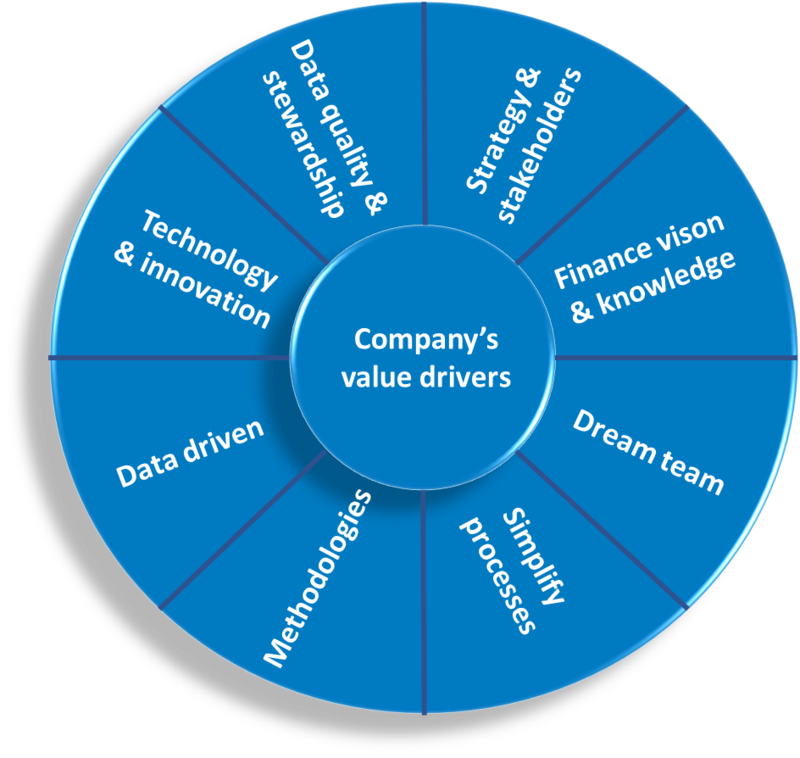 In order to advance sustainable value creation by the CFO Office insight is required in a company’s value drivers. Where value drivers are anything, e.g. an activity or capability, that can be added to a product, service or brand that will increase its value to customers. Value drivers can come in many forms such as cutting-edge technology, brand recognition, excellent supply chain management or satisfied customers. WHAT are the company’s value drivers? 1. Strategy & stakeholders: based on the company’s value drivers and strategy for sustainable value creation the information needs have to be (re)defined. With an integrated thinking and reporting approach it is important to include all stakeholders, as also external stakeholders can have an impact on the company’s reputation and with this its value. 2. Finance vision & knowledge: the CFO Office is in a unique position to provide the knowledge and expertise with methodologies to understand and advance profitability and sustainable value creation when acting as a business partner and strategic advisor. 3. Dream team: is a highly skilled mixed team with methodological, process, end user and IT expertise to run the transformation program. The extended dream team encompasses all people in the CFO Office and business users to be trained on analytical and soft skills (e.g. communication) to be the business partner required. 4. 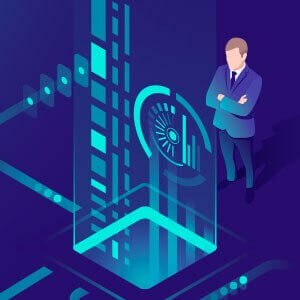 Simplify processes: to focus on added value activities and to empower people into their evolving role of business partner and strategic advisor automation of and standardization in processes is required. A smart and unified system provides workflow and governance with process orchestration capabilities. 5. Methodologies: without applying the right methods it is hard to e.g. define the customer life time value and monitor the execution of the strategy. E.g. activity-based management calculation rules must be defined for customer, product and services profitability. A strategy map can be used to align strategy with execution. An assessment on HOW to apply and simplify methodologies is part of the 360°approach to include in the finance transformation roadmap. 6. Data driven: with a single data point model and an information centric data hub the planning and control cycle is optimized for both the compliance function of the CFO Office and to advance operations with analytics for insight and actionable forward-looking information. 7. Technology & innovation: innovative technology is really making a difference and the pace of change is increasing. Think about artificial intelligence, machine learning, predictive analytics, cloud, etc. Ready-made platforms are accelerating digital and finance transformation. True innovators of technology and companies with bigger data models outperform others and have better access to technology-savvy talent. 8. Data quality & stewardship: finance systems are equipped to provide high quality data based on strict processes, procedures and data quality checks with validations and audit trails. Moving operational data for sustainable value creation through the same unified system and processes for performance management and analytics will advance insight, be more accurate in e.g. forecasting and close faster. Part of the modern finance transformation roadmap for sustainable value creation is to define the guiding principles, identify risks and define the critical or key success factor of the finance transformation program and before you get started. All factors mentioned above provide a balanced approach according to me. It is without saying that a factor like methodologies needs to be included in the data driven approach and to make use of technology in the most effective way. In other words, when defining a finance vision, a holistic approach is needed to define requirements from the different factors. This means looking for a unified platform to enable processes, methodologies, analytics, be data driven, and is easy to maintain and to use to empower people.